What better way to spend a holiday vacation than by cooking up treats for everyone in your family? Give these children's-literature-themed cookbooks along with a commitment to getting together to create some of the recipes and read some of the stories that go along with them. Is your niece/granddaughter/goddaughter/etc. inseparable from her American Girl doll? Give her one of the books from the American Girl Cooking Studio series. Many of the American Girls have cookbooks that include recipes from their period in history. Choose from Samantha, Julie, Kit, Molly, or Felicity. Pair The Little House Cookbook with a set of the Little House on the Prairie books by Laura Ingalls Wilder for some frontier fun. Ever wanted to try green eggs and ham? Now you can with recipes from the Green Eggs and Ham Cookbook by Georgeanne Brennan. Pair this cookbook with your favorite Dr. Seuss book to read together after the meal. For the Roald Dahl fan in your life (and, let's face it, who isn't a Roald Dahl fan? 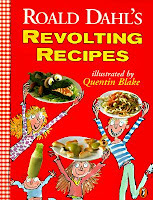 ), pick up Roald Dahl's Revolting Recipes and whip up some Snozzcumbers or fresh Mudburgers. Mmm. Pair it with The BFG, Matilda, or Charlie and the Chocolate Factory. And if that's not enough for you, grab Roald Dahl's Even More Revolting Recipes, as well. Fairy Tale Feasts: A Literary Cookbook for Young Readers and Eaters by Jane Yolen includes both stories and recipes between its covers. Cook recipes straight out of fairy tales (Runaway Pancakes, Pumpkin Tarts [from Cinderella's coach, of course], etc.). 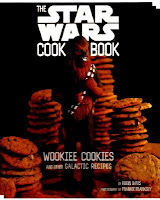 And, okay, these aren't strictly based on literature but the Star Wars Cookbooks Wookiee Cookies and Darth Malt are a HUGE hit at my library and would make a great gift for any Star Wars fan. 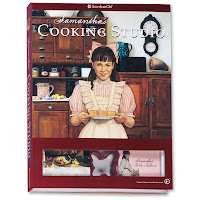 Oh, we had the Samantha and Kirsten cookbooks when we were kids. My poor, poor mother. We NEEDED to make every single recipe!